Once again the winter is creeping upon us and here at Tinto Music and Arts we are preparing for another Magical Musical Gaitherin. Over the weekend of December 2nd -4th we will host a number of workshops and an evening concert to boot. So…what do we have to offer this year? Friday night we will welcome you all with a facilitated drum circle and some song helping you to land well. Saturday will be broken up into a morning session of workshops ( 10.00am-1.00pm, breaks as required), an afternoon session of the same (2.00pm-5.00pm) and the evening gig (8.00pm- till late) This will all be followed by a final workshop session on Sunday morn (10.00am-1.00pm) before we eat a famous Wiston Roast Dinner and say our goodbyes. Born and bred in the South of Bahia. Claudio Kron do BRAZIL has travel the world sharing his beloved Brazilian culture and traditions! Claudio has just finished his album BRAZINDIAS where you can experience the flavours of AfroBrazilian culture embedded in Bahia. This year Claudio will be running workshops explaining the power of Oxira’s in the carnival music of BRAZIL. Claudio will also perform his amazing solo set for the Sat evening concert. In this solo show Claudio will be performing songs from his upcoming album plus some lovely sounds from his native Brazil. These are performed on three of Claudio’s favourite instruments: Berimbau, pandeiro and acoustic guitar. Witness the power of African culture in Brazilian traditions and expect a guest or two to join him on stage. Originally trained in theatre, Jane Bentley spent six years touring the world with the International Purves Puppets. 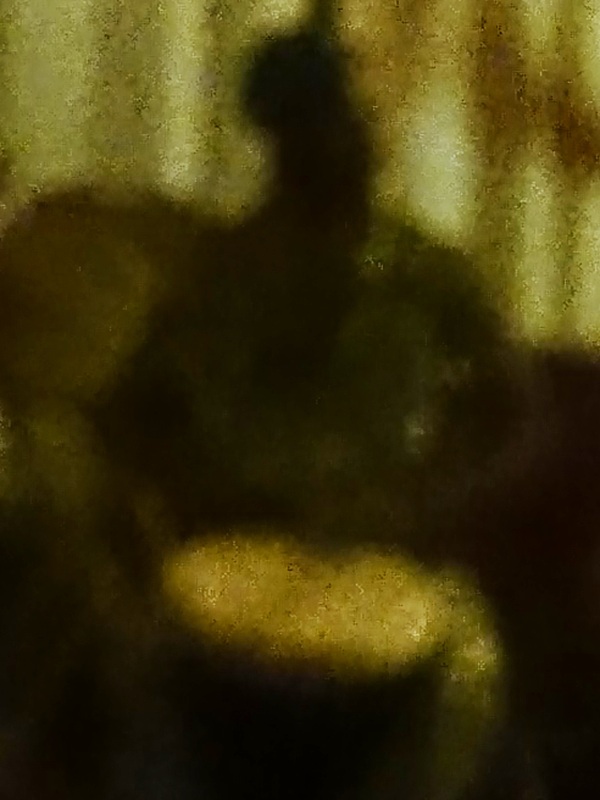 This involved being mostly invisible in such prestigious destinations as Syria, Taiwan, and Auchtermuchty village hall. Having discovered the Community Drum Circle movement in the USA, she headed off to Hawaii to train with it’s foremost exponent, Arthur Hull. 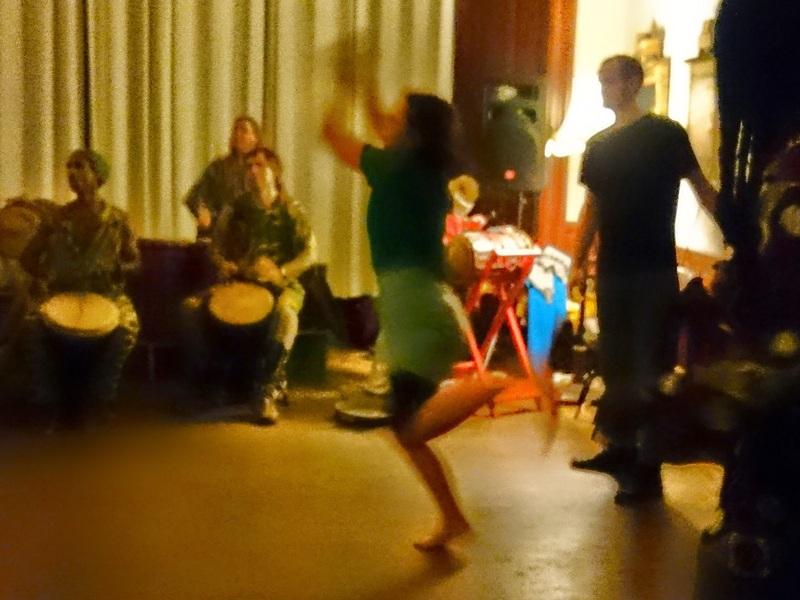 She continued her studies by completing her PhD based on drum circles and improvisation, highlighting the effects of group music making on human wellbeing – the first time that the practice of drum circle facilitation has been studied at this level. Further training has included improvisation with the Grammy award winning cellist David Darling and his Music for People organisation, vocal improvisation with Bobby McFerrin, and two Eurpoean Union Leonardo Da Vinci ‘Transfer of Innovation’ projects on music in health settings with the Royal Northern College of Music and Musique et Sante, Paris. Paul is a teacher and facilitator of rhythmical connection. His studies have taken him across the globe and he has been privileged to work with drummers and musicians from Guinea, Morocco, Senegal, Zimbabwe, Ghana, Brazil and Ireland as well as many based here in the UK. 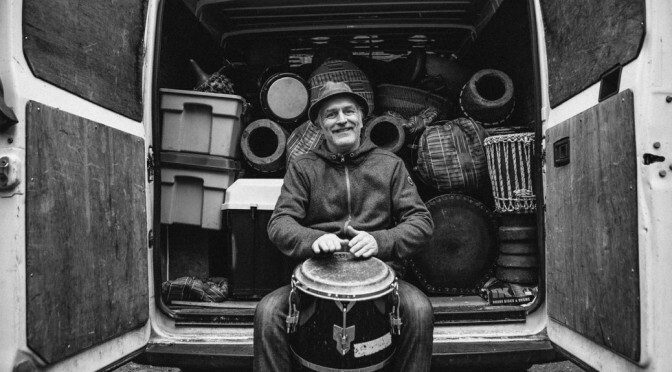 He is also a VMC (Village Music Circles) certified Drum Circle Facilitator and has worked alongside it’s founder Arthur Hull since 1999 providing training programs for Global audience. Paul will host rhythmical Alchemy sessions. 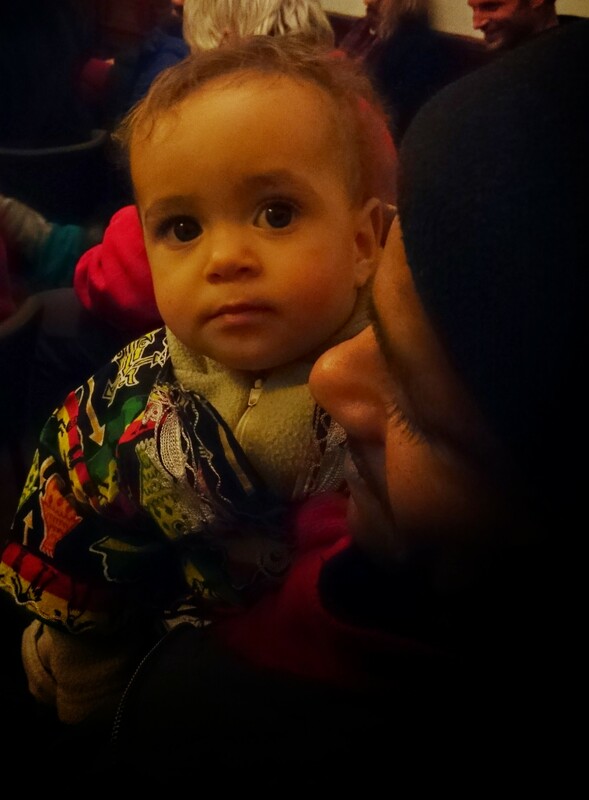 He may explore some culturally specific patterns and structures with you or delve into platformed improvisational play. Whatever road he takes, and he usually doesn’t know what that is until you show up, you will be treated to a session full of playfulness, humour and connection. You’ll leave with a smile on your face and deep rhythmical connection in your heart. All drums and percussion are provided but feel free to bring your favourite. On Saturday night we will be treated to performances from Claudio (see above), Simon Wood and Tamara and as always a few surprise appearances from within the Wiston musical stable. The night will end with either an open jam or dj’s or both!!! A fantastic night awaits you. The evocative sounds of the Hang meet the ethereal and goose bump inducing voice of Tamara who sings like an angel and plays the fiddle like a demon. Simon looks like a demon and well, plays the hang quite angelically at times. Expect slow and atmospheric music at the start with Arabic , Indian , African, Celtic and electronic influences building up to a crescendo of hypnotic trancey driving beats, hands in the air – lets hug a tree mayhem. Spring has sprung ( we hope) and better weather comes our way. Plenty to look forward to in the coming months. In June 2016 we will host another Mindfulness retreat with Br Phap Vu. Check the PAGE HERE for full details and don’t forget the weekly meditation too at The Border Collie Sangha. Later in the year we welcome back UK Playshop for a 10 day extravaganza. MORE HERE. As always there are weekly drum classes in Glasgow and no doubt a few community drum circles to attend. Keep watching this space. Another wonderful event held at Wiston Lodge during the weekend of Oct 23-25. Hosted by TMA we had 46 people attend the training with Arthur Hull and it was all rounded off with a graduation drum circle in Biggar as part of the Biggar Little Festival attended by 80 in total. Testimonials to follow and next year we will host a 6 day program. Looking forward now to our Winter Solstice Gaetherin…more to follow on that. We have just filled up the last of our places for the annual UK Playshop taking place at The Lodge on Oct 23-25. This year we will welcome facilitators from Lithuania, Turkey, Italy, England, Ireland and of course Scotland. We look forward to another fantastic training weekend which will culminate in a Community Drum Circle as part of The Biggar Little Festival on Sunday Oct 25th at 11.00am. On Oct 31st we are hosting a Mindfulness day at Wiston. Contact Meg 07835 362774 for more details. From November 1st we are beginning a Youth Music Initiative project across Dumfries and Galloway delivering Expressive Rhythm Stories and African Style drum workshops to 25 schools, (P1-P7) over a 12 week program with Paul John Dear as well as delivering CPD to the staff from all the schools. Look out for Blog updates. In December we are already hatching plans for a weekend Winter Solstice Gathering. We will have Workshops for Singing, Dancing, Drumming, Yoga, Tai Chi, and Mindfulness, a Saturday Night Concert and perhaps a Special Guest!!! Stay Tuned. Details will follow but keep Dec 18th-20th clear in your diaries. Don’t forget to follow us on both Twitter and Facebook. We were delighted to offer drum workshops through our resident rhythmical alchemist Paul John Dear and also a showcase of music on the Saturday night featuring three fabulous artisits we have met and fallen in love with since TMA came into being. Coming soon our annual fling with UKPlayshop and then a Winter Solstice Gathering that will be awesome.Awesome I tell you. This July 2015, I will set off from John O’Groats in the far North West of Scotland and head South towards Lands End in Cornwall on a journey, a rhythmical odyssey I am calling Drum Trek. The aim of the trek is to fund raise for two charities, Tinto Music and Arts ( a creative partner to Wiston Lodge) and Stainsby Festival I have worked alongside both these organisations over the last 15 years in different capacities. 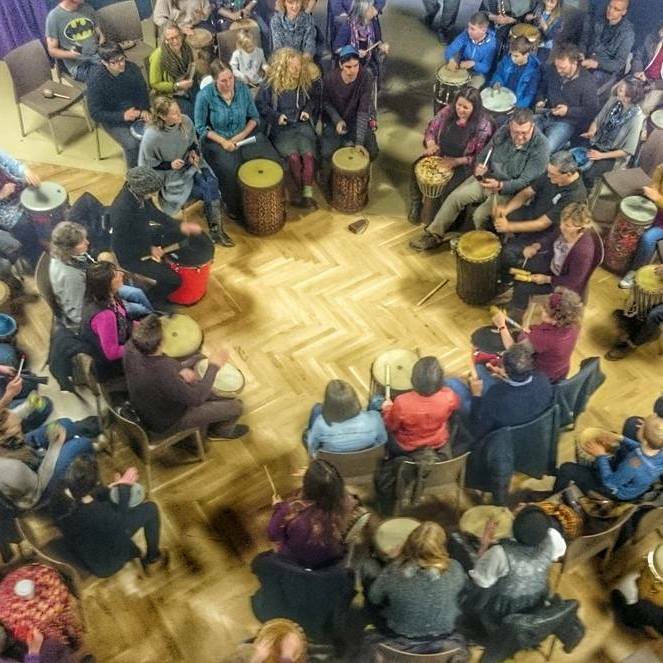 At Wiston, I have helped to deliver UK Playshop since 2008 and in the last 12 months Tinto Music and Arts has taken over the running of this internationally renowned Drum Circle Facilitator Training program, led by Arthur Hull. In that time Tinto Music and Arts has also hosted/produced a number of other events including, The Wee Drum Gathering, Rhythms of the World:Tinto Africa, The Great Northern Handpan Gathering, The Border Collie Sangha Retreat and Drum Iona. Stainsby is a real community run festival…all volunteers and a place where the community drum circle is an integral part of the event. We have had a fabulous long term relationship and every year when they pay me, I hand back the fee and say use it to support the community…and they do. My wish is to help them to purchase the land on which they have run this festival, The Field of Dreams. So both, I hope you will agree, worthy recipients of support. 2. Share, share, share via Social Media. We have a Facebook page and a Twitter account. Tell your friends about the Drum Trek Guy…Spread the word…often as possible…I would love to create a BUZZ about this. 3. Attend one of the 26 Community Drum Circles. All venues/locations and timings at the Website (ongoing updates coming in) Come along and drum drum drum. This is going to be a significant moment in my life, making this journey and connecting in with the drumming community in the UK. Please support me in whatever way you can. ……who made the Rhythms of the World residential and Tinto Africa concert such a huge success. This is the kind of event we have dreamed of hosting at Wiston Lodge since Tinto Music and Arts was incorporated back in the summer of this year 2014. We had a wonderful series of drumming workshops led by our very own Paul John Dear of Rhythmbridge connecting a wide variety of learner levels and to create some very hot grooves. The place was bouncing all weekend. The Saturday concert was everything we could have hoped for with World Class Music and Dance on offer. Johhny ‘Jali Rusholme‘ Hodgkinson for your beautiful Kora playing. Beggae. Simon Wood for a mesmerising performance on the Hang. We were blown away. Kajamor Family for the Casamance vibes. It was magical. The drummers of Ayawara and their dancers, Ashanti Harris and Romany Dear for bringing the evening to a close with a fabulous display of traditional Malinke Rhythm and Song. Lastly but never ever leastly YOU….Yep you…all of the wonderful participants who made this possible. Without you there is nothing. We feel Blessed. Oh and one final thing….there is going to be a lot more of this. We promise. Please subscribe to our blog to keep in touch and like us at Facebook and/or follow us a Twitter. Over the weekend of Dec 12th-14th 2014 Tinto Music and Arts will host a drumming workshop with Paul John Dear @ Wiston Lodge House stay, cabins and live in vehicle options. Full payment secures you a place. Limited to 25 persons. BOOK HERE Weekend Timings: Fri Dec 12th Arrive if possible for dinner at 6.00pm ( If you are going to be later we can keep food for you if we know in advance) Drum Tuition 7.30pm – 9.30pm 9.30pm onwards will be time to hang out by the fire, jam, sleep…whatever you want. Sat Dec 13th Breakfast 9.00am Drum Tuition 10.00am-1.00pm Lunch 1.00pm Drum Tuition 2.00pm – 5.00 pm Dinner 6.00pm 7.00pm Decorate and set up the Hall for the evening performance. Bring African inspired fabrics, items if you wish/can. From 8.00pm on Saturday night there will be a drum and dance performance from AYAWARA with support from a roots line up of the Kajamor Family and later we can dance the night away to sets from world music DJ’ Josh Duncan. 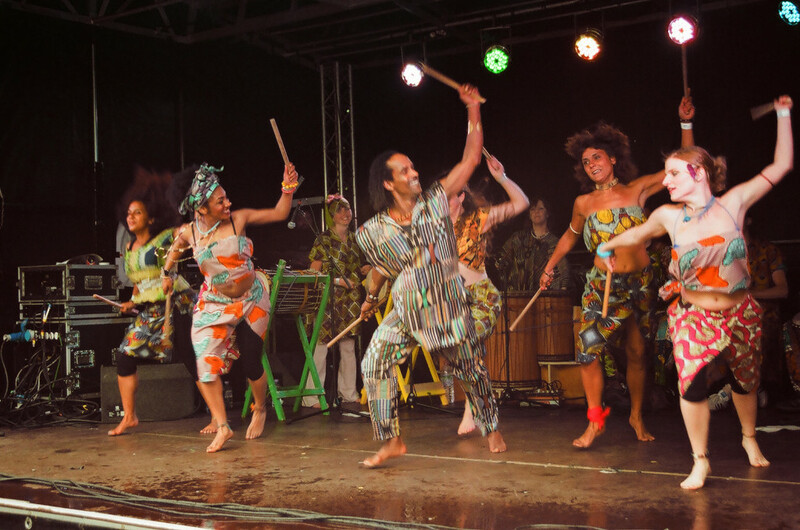 Ayawara are an Afro percussion and dance group based in Glasgow for more than 10 years. They play, and dance to the fantastic and diverse rhythms and songs of traditional West Africa (mainly from the Mandigue culture). The Kajamor Family has it’s roots in the casamance music of serouba and bougarabou. Tickets @ £10 on the door or in advance from Paul 07961 223890/ info@rhythmbridge.com This will be a fantastic weekend and a superb gig. Hope to see you there.